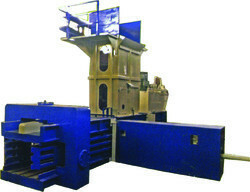 Offering you a complete choice of products which include semi-automatic scrap baling press machine, automatic hydraulic scrap baling press machine, horizontal double and triple action scrap bailing machines and iron scrap baling presses machine. Size 24" X 24" X18"
Chamber Size (Millimeter) 24" X 24" X48"
Baling Chamber Wxhxl 24" X 24" X 48"
Bail Size 24' X24' X18"
A single-ram baler is a baling machine that contains one cylinder. Because this baler is relatively smaller than the two-ram baler, it is best for small and medium commodities. Bale Size (Inched) 42" X 30" X 78"
Industrial balers are typically used to compact similar types of waste, such as office paper, Corrugated fiberboard, plastic, foil and cans, for sale to recycling companies. 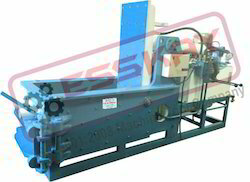 These balers are made of steel with a hydraulic ram to compress the material loaded. AutomaticScrap balers are very complex and automated, and are used where large quantities of waste are handled. Used in recycling facilities, balers are a packaging step that allows for the aforementioned commodities to be broken down into dense cubes of one type of material at a time. 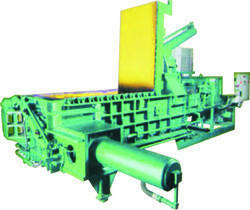 There are different balers used depending on the material type. After a specific material is crushed down into a dense cube in Automatic Scrap Bailer , it is tied to a bale by a thick wire and then pushed out of the machine. This process allows for easy transport of all materials involved. Bale Capacity 12" X14" X 8"
Looking for Scrap Baler ?